A split system will condition one room or an open area of your home. Elegant wall mounted, compact floor console and designer wall mounted indoor units are available. Split systems are renowned for quiet indoor and outdoor units and energy efficient operation owing to the advanced inverter technology. Split systems are available in Reverse Cycle providing cooling in summer and heating in winter, and incorporate a host of innovative features. The term ‘split’ refers to the fact that the two units are separated. This allows the condensing unit to be located virtually anywhere outside. With aesthetically pleasing design and power ranges of 2kW to 10kW, an ideal conditioning scenario can be designed for living space. 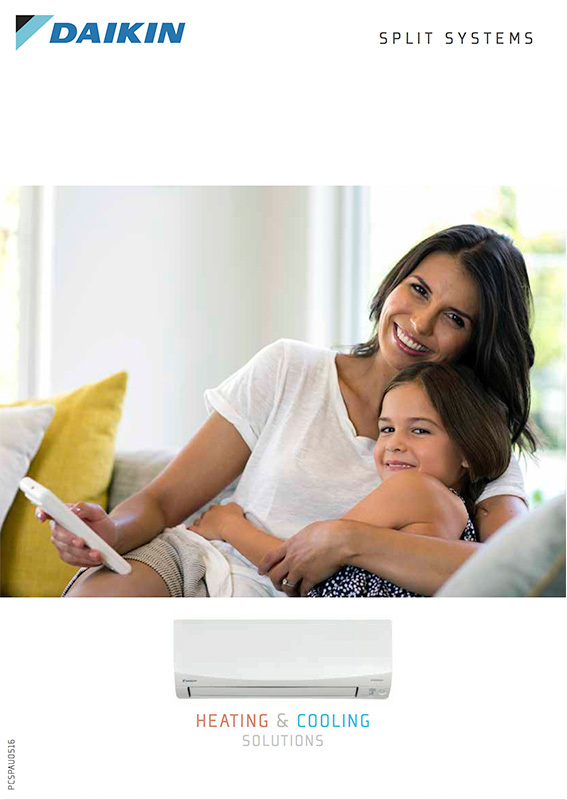 FRESH AIR – A sophisticated titanium apatite photocatalytic deodorizing air purification filter traps even microscopic airborne dust particles, absorbs bacteria and viruses, and even breaks down odours. 3D Airflow combines vertical and horizontal auto-swing to circulate air for comfort wherever you are in the room. Besides reducing humidity, this function automatically controls temperature and airflow rate and will cleverly switch into cooling mode if the room temperature rises too much. Push the POWERFUL button on the remote control and you’ll be relieved with a cooling or heating boost for a 20-minute period, even if the unit’s already operating at high capacity. When cooling, the advanced louvre design positions itself horizontally to prevent cold airflow from being blown directly onto the body. When heating, the louvre turns vertically downwards to drive warm air to the bottom of the room. The 2-area intelligent eye sensor controls comfort in two ways. If the room’s empty for 20 minutes, it starts saving energy. When someone enters the room, it immediately returns to the original setting. It can also direct airflow away from you for draft-free comfort.